I started working on this project months and months ago, so I should probably share what I’ve got so far… as always, it’s a work in progress. If you live in Milwaukee and listen to the radio, you’re probably familiar with 88.9 Radio Milwaukee. I’m certainly familiar with it, as it’s a great station, and not just for the music, but for their pieces that spotlight the great things happening in Milwaukee. Since I don’t actually live in Milwaukee right now, it’s a little difficult to pick up the broadcast at home, but no worries, since they stream it over the Internet, we can use a Raspberry Pi (a cheap single-board computer) to play the stream. 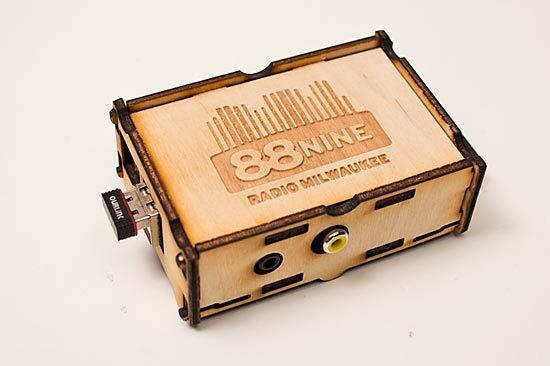 All we need to do is add some power and some speakers (and a little bit of code) and the Radio Milwaukee Radio is ready to go! I used this post to figure out how to run a script at system startup. Since the Raspberry Pi runs Linux, I’m comfortable mucking around on the command line via SSH, others might not be, but since the worst thing you can do is destroy the entire system and have to re-load it onto an SD card, the risks are small. Oh, and here’s the script. MPD is the Music Player Daemon, which deals with playing the stream, and MPC is the Music Player Client which controls the MPD server. The script tells mpc to clear whatever it’s doing (just in case) and then add the 88.9 stream, and start playing it. 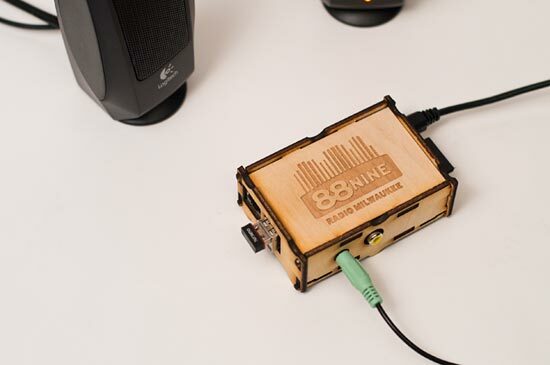 I’ve seen a lot of complex Raspberry Pi radio streaming projects, and while I’ve also played around with different clients to control things remotely via a browser running on a phone or tablet, I wanted to keep this really simple, and create a single-purpose device that did one thing… play the awesome stuff I hear on Radio Milwaukee. Note: I also wrote up a post about laser etching the logo on the Milwaukee Makerspace site. Posted on Sunday, February 10th, 2013 at 11:19 am. Subscribe to the comments feed. Both comments and pings are currently closed. Post on your own blog. Simply brilliant! A tip o’ the proverbial hat to you. Are there any formats that MPC/MPD don’t support natively? For example of we moved from MP3 to AAC, could your player handle that? Cool. I’ll try to remember to let you know (and I’ll ask Tarik to do the same) if we decide to test AAC. We’re considering moving in that direction to reduce our bandwidth requirements a bit, but I want to make sure your radio will still work. Where can I find the wireless adapter you have plugged into the Pi? I’ve been trying to find a nice one that doesn’t require a USB Hub to power. Did you have to install it any special way? But any adapter with the same chipset (or that works with Linux) should work.